NEW DELHI (AFP) - A city in northern India has shattered the national heat record, registering a searing 51 deg C - the highest since records began - the weather office said on Friday (May 20). 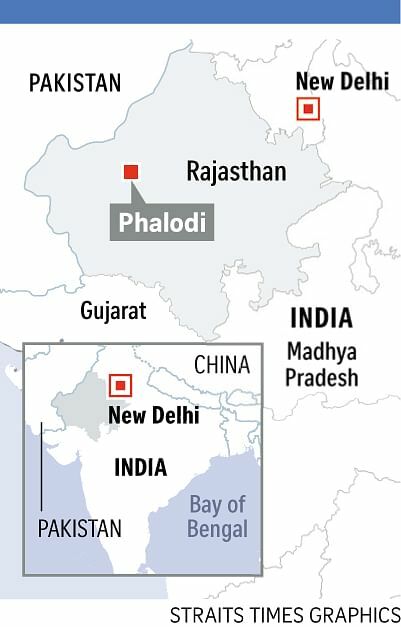 The new record in Phalodi, a city in the desert state of Rajasthan, is the equivalent of 123.8 Fahrenheit and comes as a heatwave sweeps the nation. It tops a previous record of 50.6 deg C set in 1956. "Yesterday (Thursday) was the hottest temperature ever recorded in the country... 51 degrees in Phalodi," said Mr B.P. Yadav, a director of the India Meteorological Department. Temperatures in northern India regularly hit the high 40s in May and June - the hottest months of the year - but topping 50 deg C is unusual. The weather office has issued warnings of "severe heat wave" conditions across large parts of India's northern and western regions through the weekend.